Your baby won’t remember much, if anything, about the first three years of life, but according to researchers, have a huge impact on the quality of your child’s life – in some ways more than any of the others that follow. What makes those first three years – years filled primarily with eating, sleeping, crying and playing, the years before formal learning even begin – so vital to your child’s ultimate success in school, in a career, in relationships? How can a period of time when your child is so clearly unformed be so critical to the formation of the human being your child will eventually become? The answer is fascinating, complex and still evolving. Here’s what scientists believe so far. Research shows that a child’s brain grows to 90% of its adult capacity during those first three years – granted, a lot of brainpower for someone who can’t yet die his or her shoes. During these three phenomenal years, brain ‘wiring’ occurs. (‘Wiring’ is when the crucial connections are made linking brain cells). By the third birthday, somewhere around 1000 trillion connections will have been made. With all this activity, however, a child’s brain is very much a work in progress at age 3. More connections are made until age 10 or 11, at which point the brain starts specialising for better efficiency, Eliminating connections that are rarely used. Changes continue to take place well past puberty, with important parts of the brain still continuing to change throughout life. While your child’s future- like his or her brain – is far from fully cast at age three, it does appear that those early years do form the mould that will shape the person he or she will become. And the greatest influence during those formative years is you. Research shows that the kind of care a child receives during that time determines to a large extent how well those brain connections will be made, how much that little brain will develop, how successful, how content, how confident, and how competent to handle life’s challenges that child will be. Feeling daunted and overwhelmed by the task that’s been handed you? Don’t be. Most of what any loving parent does intuitively (with no training, without the addition of flashcards or special mind expanding programs) is exactly what your child – and your child’s brain – needs to develop to his or her greatest potential. Every time you touch, hold, cuddle, hug, or respond to your baby with warm responsive care, you’re positively affecting the way your child’s brain forms connection. By reading, talking, singing, making eye contact or cooing to your baby, you’re helping your baby’s brain reach its full potential. 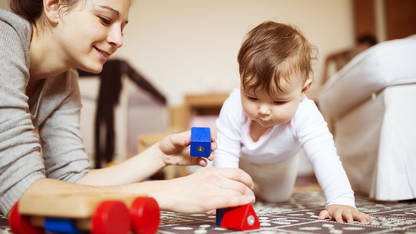 And through your positive parenting, you will be teaching your child social and emotional skills that will actually bought your child’s intellectual development as he or she gets older; the more socially and emotionally confident a child is, the more likely that child will be motivated to learn and to take on new challenges with enthusiasm and without fear of failure. Children whose basic needs are met in infancy and early childhood develop a sense of trust in others and a high level of self-confidence. Researchers have found that children reared in such nurturing environments have fewer behavioural problem in school later on, and are emotionally more capable of positive social relationships. By monitoring and helping to regulate your baby’s impulses and behaviours during the early years, you will eventually teach your child self control. Setting limits that are fair and age appropriate and enforcing them consistently will enable your child to be less likely to be anxious, frightened, impulsive or to rely on violent means to resolve conflicts later on in life, says researchers. He or she will also be more capable of intellectual learning because of the solid emotional foundation you have provided. Likewise, any caregiver who spends a significant amount of time with your child should provide the same kind of stimulation, the same time of responsiveness, the same kind of positive discipline. High quality child care will help ensure that your baby’s brain gets what it needs: lot of nurturing. Routine medical care is important, too, ensuring that your child will be screened regularly for any medical or developmental issues that could slow intellectual, social or emotional growth. It will also allow for early intervention should a problem be uncovered, which could prevent that problem from holding your child back. And here is probably the most important thing to keep in mind. Helping your child reach his or her potential is different from trying to change the person your child is; encouraging intellectual development is different from pushing it; providing stimulating experiences is different from scheduling in the kind of overload that leads to burnout. It’s easy to avoid crossing that line from just enough parental interaction and involvement to too much by taking your cues from your baby – who, when it comes to getting what he or she needs, can be wise even beyond your years. Watch and listen carefully, and you’ll almost always know what’s best for your child.